An attempt to “write the history of the science of the moment from the frontiers of research where history is being made” is a daunting enough task on its own, but to do so in a manner that is both accessible and fun for the general reader ups the ante considerably. It also calls for a writer well versed in modern scientific concepts and equally adept at communicating the sometimes incomprehensible in a plainly comprehensible style. This author is up to the task. As the editor of the weekly science section of the Dallas Morning News and former faculty member at Texas Christian University, Siegfried has the journalistic background to present the material clearly and simply. The awards he has received from organizations such as the American Psychiatric Association, the American Chemical Society, and the American Association for the Advancement of Science attest to his standing in scientific circles. Siegfried divides scientists into two species: the observers who seek to explain the things that they see, and the theorists who imagine things before they are discovered. The observer often calls upon the theorist to explain what he has seen and the theorist often calls upon the observer to discover in physicality what she has imagined. Some of the things originally imagined by theorists in the recent past and later verified by observers include antimatter, black holes, even atoms. 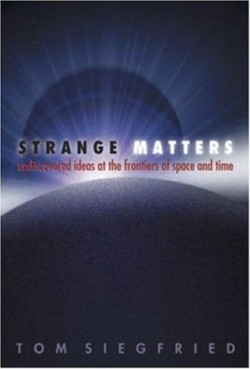 Siegfried calls these instances of theoretical anticipation “prediscoveries.” By focusing on the prediscoveries of today in the fields of physics and cosmology, this book offers the reader a glimpse into the possible future realities ready to be verified by today’s and tomorrow’s observers as the twenty-first century unfolds. Despite ideas as expansive and far-reaching as the universe itself, Siegfried manages to convey his message in an easily digestible, down-to-earth way. The reader will be provided with an intriguing preview to what may be the next version of science’s continually changing truth.